First, I will admit that I am not an expert in sail trimming. I have a 2013 SO469 with the standard 140% (I believe) Genoa. I just completed a passage from Houston, TX to Mobile, AL and from the perspective of how much time it took, it was a disaster. I bought a subscription to PredictWind and uploaded the boat's polar table into it. The forecast showed the winds would be about 30 degrees (True) off the starboard bow (from about 120 degree True), which the polar tables say at 10 knots of wind we should make 5 knots. As such, the PredictWind route had us going straight East, no tacking at all. However, when we got out on the water, the boat could not point anywhere NEAR that well. We had the sheets in tight and the genoa sheet in so much that the entire genoa was just inside the lifelines and the genoa cars were all the way back. (The jib sheets were led through the set of cars just outboard the main cabin windows, those are the only ones I have ever used. There are some additional blocks on top of the cabin, outboard of the mast, but not sure what those are for.) On the main, the traveler was pulled to windward a fair bit with the boom about centerline. Yet the boat would just not do well when the wind was within 30 degrees apparent. We could get the boat to go just over 7 knots with the wind coming from 45 degrees apparent with wind speed about 12 knots at the top of the mast, we felt good about that, but when we ran the numbers it meant the True wind angle was 80 degrees, which is basically zero progress to windward. In short, these polar numbers were way far out of reach when it came to sailing close-hauled. I'm really at a loss as to what we could have done better to point better. I admit that I am not an expert sail trimmer but I have read a couple books on it trying to learn. The only thing I can think of it maybe I was supposed to run the jib sheets through those blocks just outboard of the mast. Anyway, if anyone has any ideas or tips I'd sure appreciate it. Do you have a folding/feathering or fixed prop? I got far better pointing when I changed to a feathering prop. With the fixed prop I would always fall below the fleet. Changing the prop fixed it, I was then up with the fleet. Sail condition (especially headsail) can be another issue but given the age of you boat they should be OK. Regarding sail setting, if all groups of the tell-tails on the genoa are flying parallel on both sides of the sail when close hauled then it is set right. If say the lower ones are OK (parallel on both sides of the sail) and the upper tell-tails are pointing up or down then it is just a matter of positioning the genoa car until you get then all parallel. Hi Rob many thanks for the reply. My boat has a folding prop. I make sure, after I turn the engine off, to put the engine speed lever in reverse, which keeps the shaft from rotating which then forces the blades to collapse/fold. I then put it back in neutral to prevent an "ooops" when restarting the engine. You bring up a good point about the genoa telltales. I don't pay as much attention to them as I should, I will fix that. Part of the problem for this last trip was it was so foggy, drizzly and misty that the forward telltales on the jib had become adhered to the jib and were no longer flying free. So that definitely did not help. I also noticed I think my jib only has telltales towards the luff, should there be any by the leech? Another thing that reminds me of, I have zero telltales on the mainsail. I ordered some to put on, but not having any didn't help. But then again that's the main, and I know it doesn't have nearly the driving force as the jib/genoa. I think the biggest thing I did wrong may have been not running the jib sheets through those blocks/pulleys just outboard the mast. Those are much further inboard than the pulleys I was using which are outside the main cabin windows. But I can't for the life of me seem to verify for sure what they are supposed/designed to be used for. EDIT: Just checked the owner's manual and it says those blocks outboard the mast are for the "regular" jib, and the blocks outside the cabin window are for the Performance jib (which I think is the one I have). So unless one is supposed to run the performance jib sheets through the regular jib blocks when sailing upwind (which might require rolling up some of the genoa to reduce its size), I'm not sure this was the silver bullet I was hoping for. Putting the transmission back in neutral, MAY have made the blades start turning again. So pointing could go away. I always leave the trans in reverse to keep my max prop from turning. Those polar s could also be using the smaller jib. Since it is smaller, you can put it closer to the wind, and point higher. I can not point as high with my 130, or 140 as I can my 110 or 155! Because the clew is farther out from the center line of the boat vs the 155 or 110. Not sure what the PTE keel is, but if you are using the polars from a deep keel, and you have one of the shorter keels, especially the shoal keel, you will not point as high either! While you jib may only be 5 years old, if a dacron of lower quality, it may be stretched, and not staying in shape as well as it should be. So a new jib may or might be in order. Has the rig been tuned since you bought the boat? If the wires have stretched, you may have a mast that is not centered to the boat, Perpendicular, or curving too much while sailing. How dirty and clean is the bottom. Dirty can slow you down in general. Any and ALL of these can cause you not to meet the polars you are seeing. May I suggest the place to begin is with that jib/Genoa car, moving it forward and aft until all the tell tales on the jib stream, with the lee side ones being the most important. I have found nothing kills my performance quicker than the car in the wrong position. With my 105% jib, it seems critical within one hole in the track. I need to put on a system to adjust it closer. A lower aspect jib is probably a little less sensitive, but not much less. Very hard to do this on a wet day, you need sails dry to allow the tell tales to fly for them to tell you anything. Once you have learned how it feels you will be able to do better by feel of the boat in wet conditions. But first you have to learn what “right” feels like. On the main, start with tell tales along the leach, big inch wide ribbons of spinnaker cloth, about 300 mm long, one above each batten. My sailmaker tells me the bottom three streaming, and the top one just talking to you, (sometimes streaming, sometimes not as you go along). I have found the lower ones fairly easy to get streaming, and the top one very difficult. A friend recently showed me the subtle effect adjusting the Cunningham has on sail shape, and particularly how it makes the top one behave. I have to get the sail maker to install the eye, and then rig a line for adjustment, but it is my next project. I have always thought that there was little difference between hauling on the Cunningham and tightening the main halliard, unless you were worried about black bands, or have the head of the sail against the top mast block, but it seems more subtle than that. I still have not figured out just how, but it dramatically changes the shape of the top of the sail and gives a power lift that you can easily feel. So I would suggest working on that jib car position fore and aft on a dry day when you can see the tell tales working, add leech tell tales to the main, and once you have all except the top one on the main streaming, try the Cunningham. And aim for about 40 degrees apparent, and only when you are going well, gradually come up to 35 as you make small sail adjustments. And try both tacks, in case your wind indicator is not quite aligned fore and aft. When you are really doing the best you can with fore and aft movements of the car, you can try rigging a barberhauler to that inner sheet lead , to see if it helps before you try sheeting through there. One last thing, if you have a MFD, set up a page which includes Heading (assuming you have a heading sensor), COG, speed and VMG. Work on reducing that leeway, (the difference between COG and heading) and note the difference it makes to VMG as you trim sails and steer off a bit. And keep on trying, getting the best VMG is why sailing is such a challenge. Rene caught what I read, but did not comment on, that is the jib carr. It may be too far back as he noted. my 155 light vs strong winds for it, does not move much more than 2-4". Then again, it is also a deck sweeper. The 140 that the clew is cut to around the top of the life lines, I can move the car some 6-8" depending upon wind speed. The 110, also if you will, not a true deck sweeper, but the clew is cut close to the cabin top where that car is set at. Max of about 4"
I would also suggest line control cars for the out bound track if you can. As you can then move the car in micro amounts, to get the best sail shape. The other I like about line control, is you do not have to go out to the lee side to pull a pin, kick the car forward or aft etc. Can be a hastle in a windy big wave environment. Vs pulling lines from the cockpit. I agree with everything that has been said. My boat is an SO 45.2, which I think has a similar deck layout as yours. The track on the deck just outboard the cabin windows is the correct track for your genoa. You should trim the genoa so that the sail is about 4 inches outboard of the bottom spreader tip. The fore and aft car adjustment is as mentioned by others above, so that the telltales near the luff of the genoa are all streaming the same. The best way to check this is to slowly head upwind until the inside (windward) telltales start to luff (bounce around or droop down if the wind is very light). They should all luff at the same time. If the upper ones luff first, the car needs to go forward. If the lower ones luff first, the car needs to go back. Little adjustments can make a big difference. When you are sailing close hauled, try to keep the outside (leeward) telltales flying straight back. The inside (windward) telltales should be alternating between straight back and just beginning to luff. If you need to power up through chop or boat wakes, fall off a few degrees until the leeward telltales start to luff, the come up again when you boat speed improves. Once you trim the genoa to 4 inches off the spreader tip, you shouldn't need to adjust it again unless the wind gets stronger or weaker. You should be sitting on the leeward side of the boat so you can keep your eyes on the telltales while steering. You should have a tiny bit of weather helm when sailing close hauled. The rudder should be turned 3-5 degrees to windward to keep the boat going straight. This helps the underwater foils (keel and rudder) lift the boat as much as possible to avoid too much leeway. If you have too much weather helm or lee helm, the rig may need to be tuned fore or aft. If your doing all this and have a clean bottom and folded or feathered prop, you should be able to sail close hauled at about 30 degrees apparent in all but very light wind. If not your genoa may be stretched out, or maybe it was not that great to begin with. I would add a vote to Marty’s comment about sail shape. Most of what has been written both here, and in the many books on the subject, is based on the implied assumption that the sails are the right shape in the first place, and all you have to do is trim them well to get boat performance. However, if the sails are stretched and no longer the shape they were made, no amount of trimming will get really good performance, the pros might still do pretty well, but most of us do not need the handicap. I think these days with computer design, most sails probably start the right shape. My sailmaker tells me that before computer cutting, it was normal to have to do at least one recut of a new sail before it was really good, but with computer design and cutting, any need for a recut is now a sign of a big error. However, if the sail is made from poor quality cloth, it can stretch out of shape relatively quickly. My original ones needed replacement after only a few years. My wife was sceptical, so we took the sails along to the sail maker. He stretched them out in the loft and explained what he was looking at. He told us all the little effects on the boat handling the stretched sail shape would cause. At each point, my wife said, yes, that is exactly what we see. New sails from good cloth were a dream to trim, right from the start, apart from that top tell tail on the main that I mentioned. 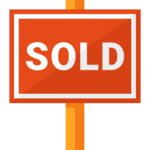 So take your sails along to a sailmaker for an assessment. Sometimes, if the cloth is mostly ok, they can be improved with a recut, but if major work is required, your money is better spent on new cloth. Marty’s post appeared while I was typing. Remarkably little duplication for two independent thoughts, and plenty to think about in each. Combined with the other posts you will have plenty to think about. And I am guessing there will be more yet. The genoa you have will be the 140%, that needs the cars on the side decks. I have the 106% which uses the cars on the coachroof, mine doesn't have the side deck ones fitted. The performance genoa is just the same size but made from mylar. For heading up wind i'll set the lower genoa telltales flying using the sheet aiming to have the windward one occasionally flicking. You'll see if your car position is out by looking at the telltales further up, if the windward ones are not flying right then the car needs moving forward, if the leward ones are not flying right then the car needs moved back. For the main, again going upwind, i'll sheet in until the boom is near the centre line (usually won't get it on the centreline with the sheet alone, traveller will be needed.) Then looking at the top telltale on the leech i'll adjust from there. If the telltale is streaming freely i'll put more mainsheet on (same as pulling on the vang) until it curls round the back of the leech every now and then. If it is stalling and curling round the back of the leech then ease of the main sheet. You will then have to pull traveller up to windward again to get the boom on the centreline. If i'm heeling too much with the main in this position i'll either drop the traveller a little or pull the tension on the vang and then ease the main out until i'm sailing at a comfortable/faster heel. I like to keep the table within the limits of the non-slip mats for the gin. Many thanks for the great replies and thoughts. I definitely need to try that technique of setting the cars using the Genoa luff telltales. I will also install some telltales on the main, it has none and also no battens since in-mast furler. However let me ask real quick please: when you all are trying to make progress to windward, what’s the closest apparent wind angle you can attain while making any kind of decent speed (like 5 knots)? I can get my boat to do about 30 degrees apparent, much closer than that and the speed drops off a lot. Knowing what others are achieving would be invaluable. Thank you all again very much. I think the problem with confirming apparent wind sailing angles is dependent on so many factors, one of the most important being condition of your sails. After time, sails stretch and lose their shape, they can be re-cut by a competent sail-maker but considering the cost involved in re-cutting or replacing, few bother and as time passes efficiency of sailing speed and wind angles decrease. Most of us take lessons to pass navigation exams yet very little is covered by sailing technique and sail trimming, this is a part of sailing that most learn by reading books and trial and error. Many years ago a professional sailor who accompanied me on a cruise kept telling me not to over sheet my sails and ease them, this I found to be good advice and when sailing with less experienced owners I too have noticed the tendency to over sheet. So my only advice not forgetting all the very good advice that has so far been posted here would be taking the "don't over sheet" rule into count, trim to the most efficient speed and wind angle and don't worry too much about pointing higher. Even boats of the same make and model will sail differently depending on all the points raised so far not forgetting weight distribution. I read somewhere that the 12 meter boats can tack through 64°. Iceboats can tack through ~40°. an issue on Lake Michigan. This is exactly what I am grappling with! Forget 30 degrees Apparent....the polars from the designer say the boat should hit 30 degrees TRUE. Which equates to 20 degrees apparent or so depending on speeds. The only thing that makes sense to me is if the polar table is in Apparent, then I could see it being close, but it clearly says True. To be clear, on my trip I had the boat reliably doing 7.2 knots with the wind 45 degrees apparent, and that was with only 8-10 knots wind true. It would move at 30 apparent but not nearly as fast. But I couldn’t get anywhere near the 30 degrees True the polar tables say. I'm beginning to see another issue, not mentioned initially, "furling main" those polars assume you have a std main, which is larger, and many times can be trimmed better than a furling main. A new main with vertical battens will help shape the main. BUT, again, being as you have less sail area, you will not sail as fast as the std main. Assuming you also have a furling jib, this too is smaller than a non furling one. Again, less sail area, slower speeds in many wind conditions. The other not mentioned as of yet, WHICH KEEL do you have? Deep or shoal draft? if you have the shoal draft, quite common on the east coast of NA for some reason, you will not point as high as a deep draft. Nor will your overall speeds be as high. As the shoal keel weighs more than a deep keel. A 30' boat like mine, 500 lbs heavier. A larger boat can be a ton or more! Another issue. many cruisers have full cockpit enclosures. This to will slow you down vs what ever polar you are looking at, due to wind resistance. They also make it harder to truly see how your sail shape is or is not doing well. My boat with a 5.5' keel can point into the 30-40* range apparent, and 40 true depending upon the sail, wind speed etc. My 130 is the worst. That is my light wind, ie under 6 knot sail. But where the car is set on the track, is at the widest part of the boat. My chance of pointing high is nil. But in light winds racing, I"ll take the extra speed not pointing as high over pointing higher and going slower overall. Won a number of races with this sail. Also as noted by Rene, lower quality sail cloth can stretch more than say a string sail, north 3dl, Ullman Fiberpath. So you loose shape, heel more, slow down etc. My 110 is a north norlam, not the bext cloth for cost it turns out. Mine is stretched and does not do as well as when I first bought it. Another to add to this, is what type of lines do you have? If you have a sta-set or yachtbraid line, these stretch at 2-3% at 20% of breaking strength. Screwing up sail shape. Vs say some of the dynema based lines, they will stretch .6-1% at 30% of breaking strength. Add that to the cloth differences, of say dacron vs a string that do the same stretch differences. You can get a lot more speed etc from better quality sail cloth and lines. One thing nice about the lines, is you can many times go to a smaller diam line, so it does not cost double in the same diam. Possibly only 30-50% more. Sail cloth, not much I can do to help the upwards of double the cost from a cheep dacron vs string style. Don't get fixated on polars. They are akin to gas milage claims of car manufacturers - nice idea but seldom if ever achievable in real life. They are more useful as indicators of " relative" speed potential of your boat at different wind speed and direction. These theoretical numbers also do not account for sea state or current. No cruising boat is going to sail to windward at 30 degrees true, period. Something got lost in translation in your table. With good sails and modest sea state you are going to be roughly 30 degrees apparent, or about 50 - 60 degrees true wind angle. Sail shape is critical to optimizing speed/pointing. Many cruisers oversheet their sails which slows the boat and makes it heel more. Get those telltales on both sails. Ease your sheets and then retighten just until the telltales on both sides of the sail are flowing smoothly back. With the genoa, as a rough guide, locate your sheet fairlead so the angle of the sheet to the clew parallels a theoretical line from the clew to the midpoint of the luff. Tweek following the three luff telltales for fine adjustment. With a furling main you will have little or no roach in the leech, so use your vang and traveller with the sheet to create a bit of twist [curve in the upper leech] when trying to get all three leech telltales flowing smoothly. Do not tighten the sheet so the main looks like a sheet of plywood [and performs as well]. In conclusion, don't let some numbers for a theoretical perfect state detract from a good day sailing. The chart must be in error and it sounds like you were going about as fast as could be expected, at an angle to your destination as can be expected. I think it's more reasonable to expect what's in the "upwind / beating angle" row. With 12kts TWS, sailing at 41° apparent, you should make 6.8kts boat speed. True wind speed or direction don't mean much once your moving. The boat runs on apparent wind. Anyway, at that speed and angle, the apparent wind speed becomes 16.3kts. Lots of good advice here. Sailing upwind is a skill that many cruisers have never really developed fully, as many seem to think it is unimportant. If you want to point well sail shape is critical, and helmsmanship is also important. It's not like reaching where you can just set your course and go. If you try to just point your boat to 30 degrees and go, you will be very slow. To sail upwind you need your keel to be generating lift, and that is not going to happen without boatspeed. Start out at lower angles, and then once the boat is up to speed you can start gaining height. Once your sails are set in upwind mode there are a couple of "gears" available to the helmsman. Start off with the jib telltales streaming aft evenly. When you have a set of waves to get through you can come down a bit into "power" gear where the leeward telltales start flicking upward. Once you have punched through the waves you can come back to point mode. When in gusty conditions, and gusts are causing you to heel more, let the boat come up into "pinch" mode, windward telltales flicking up, or even a slight backwind in the jib in extreme cases. This will serve to keep the boat flatter with the added benefit of grabbing a little extra bite to windward. You really have to concentrate on the helm to sail well upwind. Another important thing to remember is to keep the boat as flat as you can. People associate upwind sailing with heeling. Sure, they think it is exciting to bury the rail, but that is really slow. The more you heel the less effective the lift generated by the keel is. In addition, the more heel you carry the more helm input is required to keep the boat from rounding up. If your rail is in the water, then you are also digging a big hole in the water with your rudder! Your goal should be to keep the boat around 10 degrees of heel. Of course that number varies with hull design, but the principle is the same. This pic was taken on one of my first sails on our 39i. The wind speed is in apparent, it was flat water, and we are dragging a 3 blade fixed prop. I am not entirely satisfied with our sail shape, and will be sending it to the sailmaker for a recut. I am confident there is still plenty more speed to be gained! To the OP, 5kts upwind is a very low bar for your boat. There is no reason you shouldn't be able to get 6 or 7kts out of your boat. Remember, polar plots are in apparent wind, not true wind. 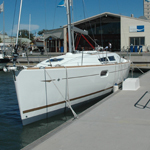 30 degrees apparent is respectable for a race boat, so you are doing well to achieve that on a cruising boat. I have a 2008 39i deep draft (6.5 ft draft) with a 110 genoa...fixed 3 blade prop that I leave in gear when sailing. i've removed the mainsail bag so the main is totally clear (hate lazyjacks), and the bottom was recently cleaned. My boat is really happy at 40 degrees off, but can point up to close to 35 without a fight, 30 off and you have to get tweaky (just not worth the headache). at 10 kts of wind we can sustain around 5kts of boat speed. 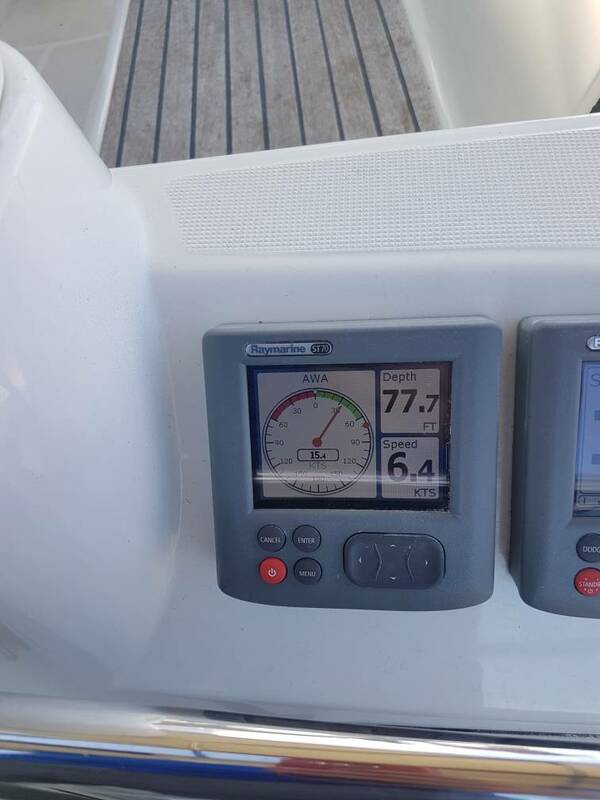 at around 15 kts I can hold close to 7 kts of boat speed. at 20 to 25 kts we've hit 8 to 8.5 consistently, no reefs. So it seems my boat prefers 15 to 25 kts get it moving. This!!!!!!!!!!!!!!!!!!!!!!!! This is one of the main things I'm trying to figure out. Zaphod, what you say here matches fairly well with what I've been able to achieve, that 30 degrees apparent is pretty good BUT - and this is a big BUT - the polar diagrams for the boat clearly say TRUE. If you use the apparent wind calculator on the 8 knot true wind speed, 32 degrees TRUE angle, 4.2 knots boat speed: it calculates to a 21 degree apparent wind angle. It doesn't sound like anyone here has gotten their boat to get anywhere near that close. That's why I am thinking the polar tables are mistaken and while it says the angles are TRUE, it should be saying Apparent. If those angles in the table were Apparent, they would align much better to my actual performance. 1) As Marty pointed out, there are some differences between the boat configuration likely used to generate the polars vs. my actual configuration. Namely, that I have an in-mast furler (which has a smaller main than the traditional) and also I use a roller reefing genoa. Not sure how much the genoa roller matters, but I'm sure the main being different has a measurable impact. My boat is a shoal draft (5.5') and I made sure to use the shoal draft table (there is a different table for the deep draft). But there is no separate table for standard mainsail vs. in-mast furling mainsail, so it makes sense that they'd use the best one (traditional) for the table. So right off the bat I need to discount the polars. I have a folding prop and make sure to collapse it by putting it in reverse, and the bottom was recently cleaned. 2) I simply need to keep getting better at sail trimming. Not having any telltales on the main does not help, and having the telltales on the genoa adhered to the sail due to wetness (they were all frozen facing forward) did not help either. But I thought you were supposed to pull the genoa cars back the closer you are to sailing upwind, but it looks like I was wrong, the point of sail does not matter the only thing that matters is how the luff telltales lift when you pinch up. I also kept the traveler and mainsheet in the "light wind" configuration (traveler way to windward and mainsheet loose so boom was over centerline) even after the wind picked up a bit (12 knots or so), I probably should have moved the traveler down and sheeted in the mainsheet. I may have been dumping a lot of wind aloft. 3) It is sounding like more and more that the polars may simply be wrong about the wind angle type; while it says the degrees are True, they sound impossible to hit from what everyone here is saying a good trim should deliver. Therefore I think the polars really mean to show Apparent wind angle, not True. I think it's more reasonable to expect what's in the "upwind / beating angle" row. With 12kts TWS, sailing at 41° apparent, you should make 6.8kts boat speed. Very critical thing you mention - you say "sailing 41 degrees apparent you should hit 6.8 knots". I see where you pull that from the "Up Wind" section at the bottom of the polar table. BUT, if you look at the big table above, it seems pretty clear that 41 degrees shown is not Apparent, that 41 degrees that it is referencing is TRUE. Running 41 degrees TRUE, wind speed 12 knots, boat speed 6.8, through the apparent wind calculator means the Apparent wind angle for this "best angle to windward" is 26.4 degrees Apparent. That seems impossibly tight based on what people are saying here. EDIT: To throw a wrench in the theory that the polar table must be showing apparent angles, I tried converting the table by saying the angles shown were Apparent and then calculating what the True would be. This worked up until the data point of 80 degrees (Apparent), 6 knots of True wind speed, and boat speed 6.33. The apparent wind calculator says this combination is impossible, the vectors do not work. So either the 6 knots of wind must also be Apparent (not just the wind direction should be Apparent), or the table is True/True. Definitely the shoal keel and roller furling main are going to hurt your upwind performance. The furling headsail shouldn't hurt as much if it is fairly new, and you havent got it partially furled. A roller reefed headsail will have terrible shape. Don't pay too much attention to the polar plots. They are theoretical, and assume perfect sail shape, and perfect underwater foils as well. If you ever get a chance to go racing on a well prepared race boat with good sails you will learn a lot about what it takes to get good upwind performance. The polars will be for a boat in perfect condition, brand new sails, no cruising gear, probably no anchor/chain and maybe even a polished bottom rather than antifouling and so on. Plus it does mention 6 persons on board, so expect that they were on the rail. Assuming you have the original Jeanneau sails, then at 6-7 years old they will have lost a lot of shape and the basic sails were probably not so good to start with. You probably have several season of AF on the bottom that will affect performance unless it's perfectly tunes, rig needs retensioning, cruising or even day sailing gear, weight distribution, crew not on the rail and so on will affect your speed and pointing. Most of all, your sail trim is probably lacking. Might be worth paying some racer to come out with you to help you improve your sail trim. I think Hoppy hits the nail on the head. Manufacturers claims are not come by sailing an average boat with all the bits added on an average day. They will be stripped to next to nothing and sailed in perfect conditions of wind and water. They may have made several if not dozens of runs and then latched onto the best speeds achieved. Also... No two boats are the same. I sailed a couple of indentical Dufours in the past (manufactured one after the other) one was very quick and the other a total slouch and no-one could say why this was. I too am having difficulty getting my head around the true/apparent question relating to this table. At the bottom of the table it also shows beating angle/speed/VMG can anyone explain this part of the table to me? As your boat is classed as a Sun Odyssey rather than a Sun Fast I presume Jeanneau regard it as a cruiser. In which case getting inside 30 degrees would be quite an achievement. I do have to say however that a table rather than a polar diagram is much easier to read. Might just convert the diagram to a table for my boat type.